For centuries have academics and politicians debated the merits and demerits of central planning. 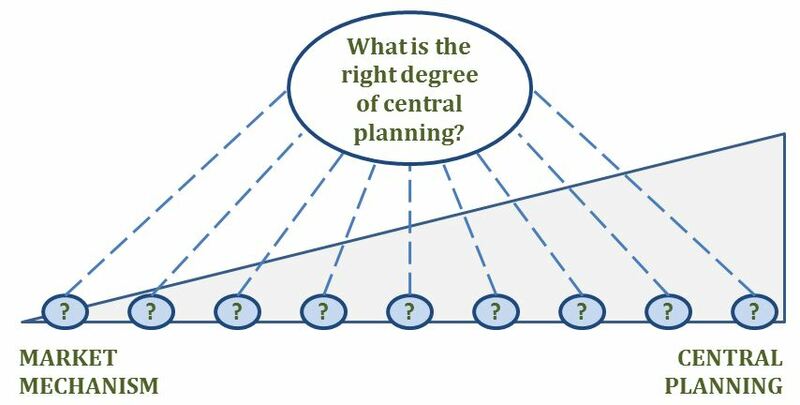 Central planning (or economic planning, or planned economy) is a mechanism that directly allocate resources. A central authority decides how and where stuff is produced and consumed. It contrasts with its ideological counterpart, the market mechanism, in which resources are allocated indirectly by buyers and sellers who make decisions within regulated marketplaces. 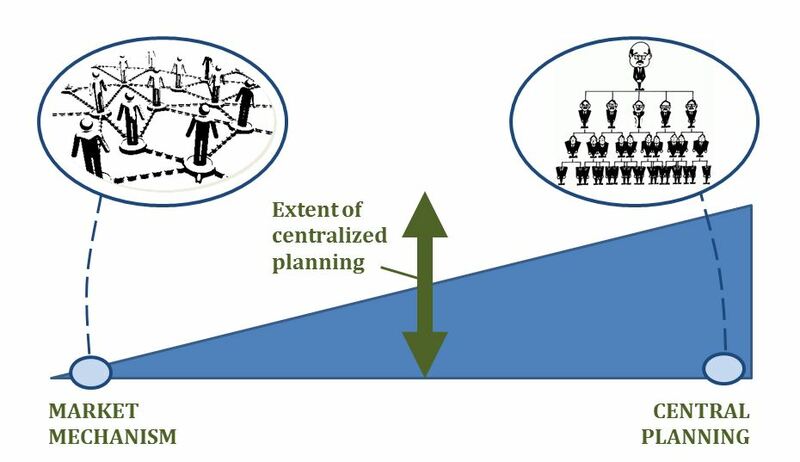 Central planning works well if you assume that society has relatively simple and fixed goals, that can be understood by a few individuals, so that they can coordinate efforts to reach these goals in a top-down manner. This world would have very homogeneous people, with very similar opinions. If these opinions are not similar, enforcement is necessary – the central planning model does not allow for discussion and differentiation. This model resembles most war economies and dictatorships. The market mechanism, on the contrary, takes the individual as its starting point, rather than the collective. It argues that a market transaction should (and if proper regulation is in place, would) take place if and only if both the seller and the buyer derive value of the deal. The price mechanism, determining prices given supply and demand levels, functions as the oil in the machine. The biggest practical merit of the market mechanism is that it is amazingly efficient. Individuals have almost infinitely more intimate and complete information on what their own needs and wishes are than any central authority ever could hope to have. In a centrally planned economy, it is one authority that has to know everything about everyone. In a market economy, you only need to know your own needs. A market mechanism is therefore incredibly efficient in satisfying those very needs. Every individual is put in charge of satisfying his own needs. Moreover, the market mechanism is dynamic. As supply (for example, the introduction of a new smartphone, or the invention of an electric motor) and demand (e.g. higher hygiene standards, or lower demand for cigarettes) change and evolve, the mechanism accommodates. It allows for the ultimate process of experimentation and trial-and-error through which individual ingenuity can bring tomorrow’s laggards above today’s mean. During much of the Cold War era, the two ideologies were in a true arms race to determine which system worked best. On one side of the spectrum, libertarian views held that (the individuals that make up) the economy should be freed from government interference as much as possible. On the other extreme, socialists and communists proclaimed a firm belief in economic planning. Somewhat in the middle were the Keynesian economists. They believed in the market mechanism, but that it was faulty and that the government should step in whenever it behaves erratically. Over time, a consensus materialized that market impulses are crucial for sustained economic growth. 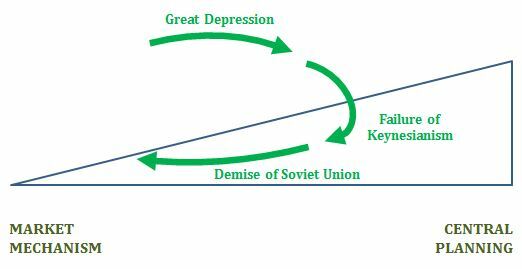 A key event that conclusively shifted beliefs away from central planning is the collapse of the Soviet Union. In the last decade, however, a strong consensus developed that a pure, uncontrolled market mechanism has adverse effects as well – social security and regulation on, for instance, financial markets, are necessary as well. There is plentiful evidence of the success of market economies. Looking at innovations, all major breakthroughs that improved life for society as a whole were rooted in discoveries that were made through experimentation by individuals, that would have never taken place if these individuals had acted on central directions. Looking at countries like China and Russia, it has to be concluded that any economic growth they have seen in recent years has come from moving towards a market economy – not from the elements of central planning that you might still find. In fact, there is no example of successful and sustainable central economic planning. Anywhere. Ever. The discussion seems settled. Only a very myopic mind would still claim that a fully socialist state would result in a somehow desirable society. Even self-proclaimed socialist parties aren’t really that socialist anymore. They take the market mechanism as their foundation – they only see a bigger role for the government in curbing its demerits. Not one single significant political party would still want to dismantle the markets as we know them today. The time of central planning has gone. A while ago, over 1,000 high-profile artificial intelligence experts and leading researchers have signed an open letter warning of a “military artificial intelligence arms race” and calling for a ban on “offensive autonomous weapons”. The authors of the letters fear a renewed arms race to develop the weapons that are capable of selecting targets and operating autonomously without direct human control. They seek to prevent this arms race before it starts. Right now, their fear centers around (offensive) weapons that can be deployed by human beings. But it is not a stretch to imagine that Artificial Intelligence (AI), when it is conclusively developed, could play a pivotal role in command centers as well, deciding where and when weapons are to be deployed. What if AI, based on information from dozens of sources including satellite images, social media messages, and bank statements, could have predicted the rise of Islamic State already early in 2014, before the movement gained the momentum it has today? And, that preemptively launching a missile, or putting someone in power at a strategic position, might have prevented its rise altogether? What if, on September 10, 2001, an AI-powered computer program would have issued a warning for impending terrorist attacks ? AI could, one day, draw such inferences because it will have access to computational powers far superior to our human brains. Within a single instant, it could access, analyse, and interpret more data than you and I could in our entire lifetimes. Such a situation does seem to exhibit remarkable parallels with the nuclear arms race of the Cold War. If you are the first to employ such a system, it might help you to strategically take out your main adversaries, (long) before they become too strong. You might rule the world. Although a positively scary scenario, we have at least a couple of decades left before such a system could ever be deployed – if it would ever be developed. But let’s take this back to our economical discussion. In the dystopian novel the Circle by Dave Eggers, politicians agree to wear a camera, whenever and wherever. Through social media, their audience – that is, the world – can follow their actions. Nothing is hidden anymore. Decisions can be openly judged. Corruption is eradicated. Of course, there are huge downsides as well. It’s dystopian and not utopian, in the first place. But what if politicians could promise, “If you vote for me, I will let AI decide what to do in terms of X”? So, what if AI would become so powerful that it could form an opinion about what the right government policies would be? No black versus white, poor versus rich, man versus women, short versus long term – an “objective” (whatever that means) computer determining an optimal, unbiased, fair, balanced policy. Friedrich von Hayek described in one of his best-known books, The Road to Serfdom, that central planning would ultimately fall short of market mechanisms because planners will never have enough information to carry out the resource allocation reliably. Even if, miraculously, they would have every necessary bit of information, it would be impossible to act on it all – that is, to analyse it, to interpret it, and to derive meaningful conclusions based on it. And that’s exactly where AI could swing the balance. Sure, as long as the central planners are human beings, they would never be able to collect and process all necessary data. But what if they are computers? There are already incredibly complex pieces of hard- and software out there that measure and analyse more than we could comprehend. What’s missing is the software that would connect these separate modules. What’s missing is the computerized central planner. Politicians have tried to “objectify” their economic policies by referring to complex and seemingly independent analyses. In the Netherlands, political parties don’t usually issue economic policy estimates themselves. They create an election program and send it in to the CPB (Netherland Bureau of Economic Policy Analysis). CPB analysts then calculate the effect for government debt levels, economic growth, and unemployment levels. I could write a critique arguing that I can list at least 5 methodological reasons why we shouldn’t trust these estimates – but that’s a blog post for another day. The point is, these independent estimates are taken very seriously. If such AI were to be developed in the future, bear in mind that this would happen, let’s say, at least 50 years from now, but most likely more than 100 years from now. That’s a long time. The people that are born today and tomorrow will be less mistrustful of such technology than you and I, in exactly the same way today’s teenagers grow up with smartphones where their parents did not. They might actually trust AI better than politicians. Who’s to say that some minority political leader may not even have an incentive to use AI for his policies, as he would not stand a chance to win otherwise? 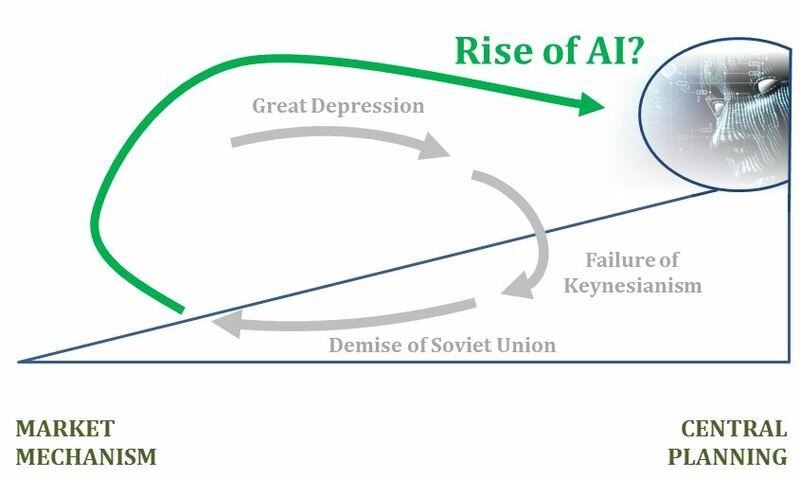 This entry was posted in Economics, Politics and tagged AI, artificial intelligence, economics, policy, politics.